1956 Vintage Map of the World, Chocolat Menier - theVintageMapShop.com - the Vintage Map Shop, Inc. 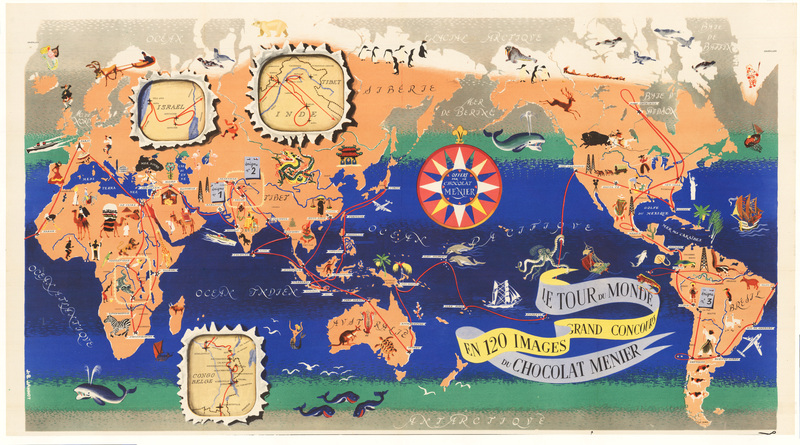 This is a splendid pictorial map of the world by Chotolat Menier. The map features 120 images of explorers, plants, animals, and structures from around the world. Three small inserts present maps of the Congo, India and Tibet, and Israel. A red line of travel connects each place name on the map and the seas are colored by their distance from the equator. The Menier Chocolate Company was founded in 1816 as a pharmaceutical manufacturer in Paris, France, at a time when chocolate was used as a medicinal product and was only one part of the overall business. The business grew rapidly but for the first few years the company's production of chocolate was very limited, as its primary usage was as a medicinal powder and for coating bitter-tasting pills. In 1893 the company began using advertising posters created by Firmin Bouisset featuring a little girl using a piece of chocolate to write the name Chocolat Menier on a wall or window. The small girl's sweet innocence conveyed the sweet chocolate message through her "chocolate graffiti". It proved to be a highly successful image and became an internationally recognized symbol. Firmin Bouisset's image of the little girl would be featured on Menier's packaged products as well as on promotional items such as reusable tin ware, creamers, bowls, sugar dishes, plates, canister sets, and even children's exercise books. With their growing international presence, the Menier Chocolate Company exhibited at the 1893 World's Fair in Chicago where they were billed as the leading chocolate makers in the world. World War I marked the beginning of the decline of the Menier Chocolate company. While Europe was in turmoil and businesses there suffered greatly, rapid expansion was taking place in neutral Switzerland and in the United States.